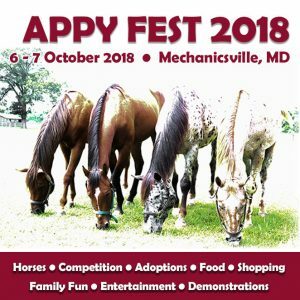 APPY FEST is a family-friendly Fall festival celebrating the healthy, happy Wicomico Appaloosas, bringing them to a place where prospective owners can meet them, fall in love, and adopt them. APPY FEST includes a Trainers’ Competition, Horse Adoptions, Equine Demonstrations, plus shopping, food and family fun. So come out to the farm October 6-7 and see the horses, shop, and enjoy the lovely fall weather.